Grand debates over reduction and emergence are playing out across the sciences, but these debates have reached a stalemate, with both sides declaring victory on empirical grounds. 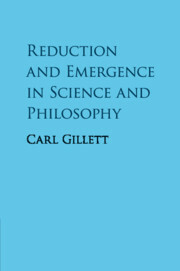 In this book, Carl Gillett provides new theoretical frameworks with which to understand these debates, illuminating both the novel positions of scientific reductionists and emergentists and the recent empirical advances that drive these new views. Gillett also highlights the flaws in existing philosophical frameworks and reorients the discussion to reflect the new scientific advances and issues, including the nature of 'parts' and 'wholes', the character of aggregation, and thus the continuity of nature itself. Most importantly, Gillett shows how disputes about concrete scientific cases are empirically resolvable and hence how we can break the scientific stalemate. Including a detailed glossary of key terms, this volume will be valuable for researchers and advanced students of the philosophy of science and metaphysics, and scientific researchers working in the area. Preface; Introduction; Part I. Groundwork: 1. Scientific composition, the universe and everything: or, reductionism and emergentism in the sciences and philosophy; 2. A beginning framework for scientific composition; Part II. The Roots of Reduction: 3. How to be a scientific reductionist: defending 'nothing but' claims and an ultimate scientific image; 4. Understanding scientific reductionism: fundamentalist views of ontology, laws, theories, and methodology; Part III. The Fruits of Emergence: 5. The varieties of emergence: their natures, purposes and obligations; 6. A whole lot more from 'nothing but': conditioned aggregation, machresis and the possibility of strong emergence; 7. Understanding scientific emergentism: a mutualist nature and its interdependent levels, laws and sciences; Part IV. New Landscapes, New Horizons: 8. Our competing visions of nature and the sciences: illuminating the deeper debates and viable positions; 9. Making the issues concrete: the scientific hypotheses and their empirical differences; 10. The age of reduction versus the age of emergence: what has been successfully shown from the sciences (so far); Glossary; Bibliography; Index. Carl Gillett is Professor of Philosophy at Northern Illinois University. He is the editor of Physicalism and its Discontents (with Barry Loewer, Cambridge, 2001) and has published numerous articles in journals, including Analysis, The Journal of Philosophy, Mind and Language, Philosophical Psychology and Synthese.